To celebrate the countryside this festive season we’re launching our very own interactive Advent Calendar, showing off our most beautiful landscapes in all their wintry glory. Each day in December in the run-up to Christmas Day, we will shine a spotlight on some of our national treasures - and we’d love people to get involved and share their very own photos from frosty forests to icy lakes. Already millions of people enjoy getting out and exploring our countryside each year, but in the winter months our stunning attractions are turned into ‘Winter Wonderlands’, hosting magical events from Christmas markets to Santa Grottos. We hope more people take the opportunity to wrap up in their jumpers and explore the very best of the countryside this Winter. 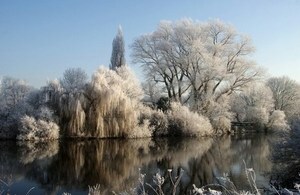 The winter months are the perfect time to explore the countryside when it looks like a ‘Winter Wonderland’. England is home to astounding spots of natural beauty, and from wonderful walking trails around ancient castles to frosty country parks and forests, there are countless attractions for people to enjoy. Our Winter Wonderlands can play a huge role in boosting our local rural economies, and through tourism these beautiful places are worth over £210 billion. As well as posting our Real Winter Wonderland pictures, we want to hear from you and are asking people across the country to join in by sharing their own images. Just post your favourite image on Twitter, Facebook and Instagram of a Winter Wonderland using the hashtag #RealWinterWonderland and we will celebrate the best of your images by re-sharing them.